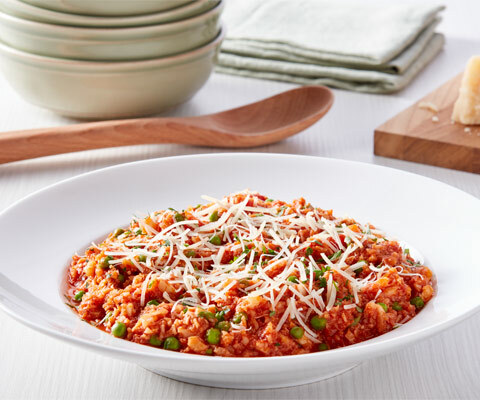 Here&apos;s a smart twist on risotto. Heat oil in large skillet on medium heat. Add cauliflower; cook and stir 4 to 5 min. or until crisp-tender. Add pasta sauce and peas; stir. Cook 4 to 5 min. or until cauliflower is tender and pasta sauce mixture is heated through, stirring frequently. Remove from heat. Add 3/4 cup cheese; stir until melted. Top with remaining cheese. Look for cauliflower rice in the refrigerated produce section or frozen foods section of your supermarket. Or to make your own cauliflower rice, use pulsing action of food processor to process 5 cups small cauliflower florets until cauliflower resembles uncooked rice. This should yield the 4-cup measure of cauliflower rice needed to prepare this delicious recipe. Here&apos;s a smart twist on risotto. Using cauliflower in place of rice not only adds a good source of vitamin C but it&apos;s a great way to add more vegetables to your diet. Plus, you&apos;ll get a good source of vitamin A from the tomato sauce too! This was a great quick dinner for nights on the go. I love how healthy it is and i had all of the ingredients already. Will definitely make this again after a long day or for a quick pick me up!